Ah, chocolate mint. My favourite. So basically I love that it’s completely appropriate to make all of the things minty at this time of year! Because what’s mint without chocolate? Okay, it’s good. I like mint all alone too. But chocolate makes everything better. Especially mint. Mmmmm…I want to go make more of this popcorn. I made it yesterday. And it’s all gone. That’s how good it is. I pretty much had to hide some of it just so it lasted until today so I could take some pictures of it. I actually thought I might have to make another batch just to be able to get pictures for you. That’s how fast it was disappearing. I had to ban everyone from touching the rest of it, and I wasn’t entirely sure that they were going to listen! But luckily they did, because it was amazing and I needed to share it with you. It’s also really sugary though and I honestly did not NEED to make more of this stuff. My diet would not have appreciated it. Of course, it’s not quite St. Patrick’s Day yet, and it’s all gone already. And it’s so, so good…..maybe we’ll have to make a little more after all. I mean, you need a green snack on the actual day right? Definitely. Forget the diet, chocolate mint popcorn is where it’s at. 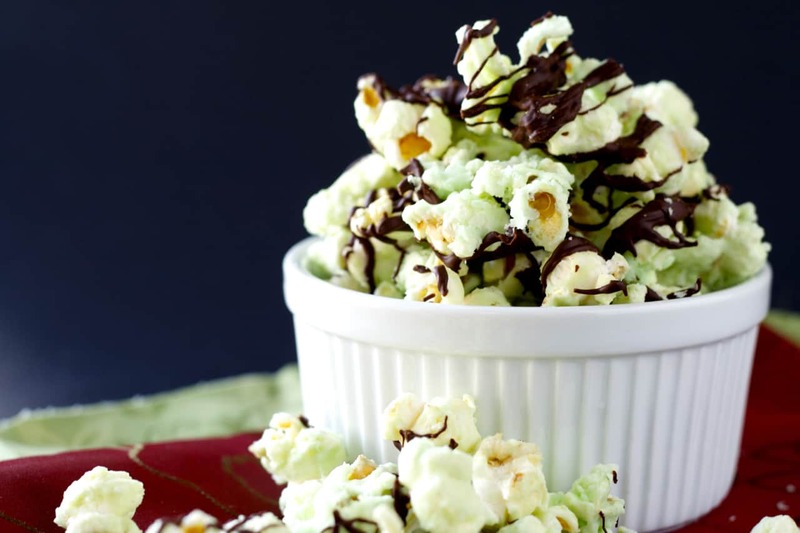 If you like chocolate and mint, you need to make this popcorn. It’s incredible. My husband said it would have been better without the chocolate, but he’s wrong. Nothing is better without chocolate. That’s just a fact. But if you’re crazy like him, feel free to leave it off. I suppose we can still be friends. Maybe. Trust me. Make this chocolate mint popcorn. You will love it. And put chocolate on it, it’s better that way! Pop the popcorn kernels, however you like, I used an air popper because it’s quick. Preheat the oven to 300 degrees F.
Line 2 baking sheets with parchment paper and set aside. In a medium saucepan place the sugar, butter, milk and salt. Heat over medium heat, stirring constantly with a silicone spatula, until the butter melts and the mixture comes to a rolling boil. Boil, stirring constantly, for one minute and then remove from the heat. Stir in the peppermint extract and the food colouring, if using. Pour the mixture over the popcorn, and stir the popcorn with the silicone spatula, or a wooden spoon, until it is evenly coated. You need to do this quickly before the sugar mixture cools off too much. Spread the popcorn onto the prepared baking sheets. Bake for 12-15 minutes until the popcorn is dry and crunchy. Remove from the oven and let it cool completely. Melt the chocolate in a microwave safe dish, at 50% power for 2-3 minutes, stirring every 30 seconds until completely melted. Drizzle over the popcorn. Allow the chocolate to set before storing the popcorn in an airtight container at room temperature. Totally addictive, not to mention adorable. I would not be able to stop eating this! Um, yes, we could not. It was gone ridiculously fast. :) Thanks Mir! The best popcorn ever!! Mint and chocolate make that salty sweet thing perfect! That salty sweet combo always makes me happy! :) Thanks Dorothy! Um yes, yes it was. And we did NOT back away! A little too good possibly! Thanks Ashley! You are a genius lady. I LOVE chocolate and mint but have never seen it in popcorn! I was just telling my husband we should probably be having popcorn with our movie instead of cake... and I'd totally swap for some of this stuff! Haha, cake totally works with a movie too! This is the best of both worlds, salty and sweet! Thanks Ashley! Such a classic combination of flavors with a fun twist! Love your creativity here, Stacey!! 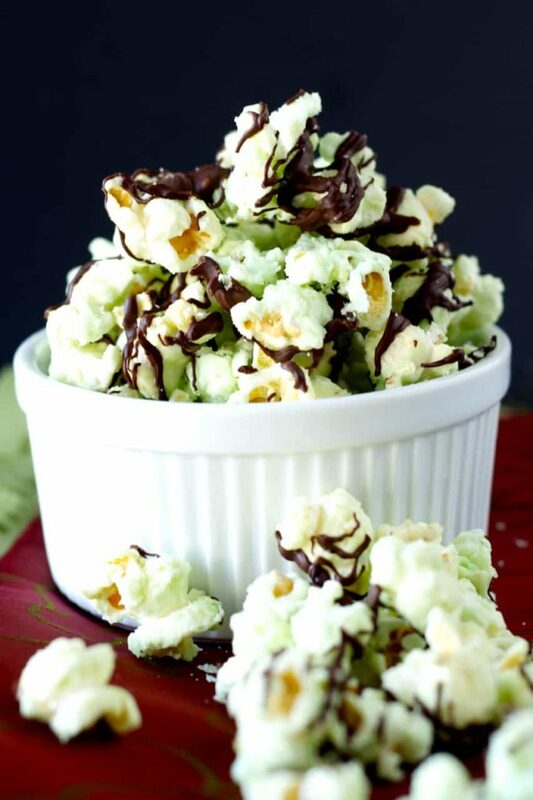 This chocolate mint popcorn sounds amazing! What a nice mixup! I love this Stacey! It's so funny I had thought of posting a mint popcorn recipe too, haha! Chocolate and mint is one of my favorite combinations. Love that you added salty with the popcorn. Looks great! You need salty with the sweet, I think! Thanks Kelley! This popcorn looks so cool Stacey! And I'm sure it tastes delicious! Pinned to try it! Chocolate and mint is such a fantastic combo! Love how pretty and festive this popcorn is! This would be a big hit at our house! I'm all for minty this time of year! Well, I'm really all for minty any time of year! Love this idea, Stacey! Pinning for later! Ya me too, mint is great any time of year! Thanks Justine! You are killing me with your creativity, Stacey! I love this mint popcorn. You're such a genius! 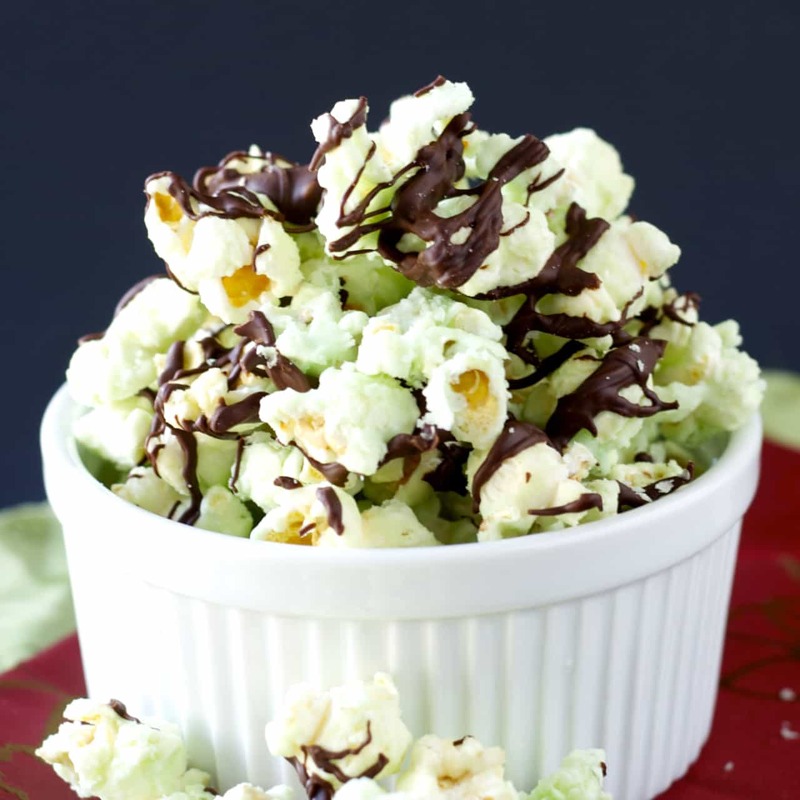 Chocolate and mint are a winning combination…..but adding popcorn to the mix is a GREAT idea!! Thanks!! Wow - this looks absolutely incredible Stacey. Happy Friday! You're on a roll with mint recipes, Stacey! Love it! This popcorn looks delicious! I love making flavored kinds like this, and chocolate and mint are pretty much the best combo. I think I would devour the whole bowl in one sitting! Um, yes, we kind of did. Except for the small bit I hid so I could take pictures! :) Oh well, not like popcorn ever lasts long so it's all good. Thanks Gayle!